Children love these small dinosaur figures. 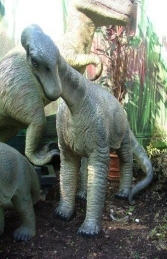 What better models then to attract attention in any pre-historic themed area? This Raptor model looks fantastic in combination with our other small dinosaurs, e.g. the 3ft Triceratops, Stegosaurus and Camasaurus models.